Limpopo, South Africa’s vibrant northern-most province is authentic Africa in all her glory. Here you will discover The Pearls of Limpopo amidst a backdrop of vast savannas, swaying golden grasslands, rugged mountain ranges, rich local culture and a truly dazzling array of wildlife. The Pearls themselves are a collection of four beautiful lodges that epitomize the enchanting wonder and magnificence of this very special part of South Africa. The world famous Kruger National Park and Botswana’s Northern Tuli Game Reserve are also within easy reach. The Pearls of Limpopo collectively showcase a stunning combination of wildlife, culture, and history set within the most generous and dramatic of African landscapes. Each lodge, with individual flair and unique styling, is a hallmark of tranquillity, privacy, spacious accommodation, excellent service and outstanding cuisine. Discover the African Bush a mere 3.5 hours out of Johannesburg. Enjoy viewing “safe” plains game on Kololo by safari vehicle, on foot or mountain bike and see the Big 5 on neighboring Welgevonden. Enjoy a dinner in the bush and learn all about the stars in the great African sky. Mopane Bush Lodge – 3 nights including a Mapungubwe Heritage tour, a Mapungubwe National Park drive and a San rock art tour. 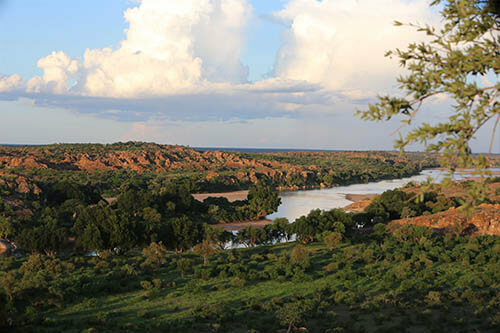 After a 4 hour drive to Mopane Bush Lodge, explore the breath-taking beauty of the Mapungubwe Cultural Landscape and National Park replete with generous African vistas, baobabs and sandstone cliffs and a wondrous variety of wildlife. Let San Rock Art and ancient Bantu archaeological sites whisper to you of a time long ago. Another 2-hour drive leads you to Leshiba, quite simply a hidden paradise on top of the Soutpansberg Mountains. Languish in this luxurious living sculpture and marvel at the magnificent views of the surrounding area. Experience Venda culture, horse riding or just relax and enjoy the abundant game and birdlife. About a 1-hour drive takes you to Madi a Thavha, which lies against a vast and beautiful mountain backdrop. Immerse yourself in the vivid color and rich splendor of Venda and Tsonga culture and tradition. Learn about the people, their art, crafts and tribal folklore. Either return to Johannesburg, about 4.5 hours drive or continue on to the Kruger National Park, about 2 hours to Pafuri or Punda Maria gates.